Swing your driver like a baseball bat to learn the feeling of a smooth, continuous motion. After some solid opening holes, the wheels have begun to wobble. You start missing fairways, and your wayward approaches put stress on your short game. Don't give up on a good score! Even Tour players sometimes bring their B or C game to the course, but they usually find a way to post a decent number on the back nine. The secret? Don't try to be perfect with every shot—work with the game you have today. Here are a few mid-round fixes and strategy adjustments that can help you put the shakiest rounds back on track. Driving it all over the course? You have options. You can ditch your driver and throttle back with a 3-wood or hybrid. You'll sacrifice distance, but hey—would you rather hit your second shot from the short grass or from behind the snack shack? Another option is to play your miss. Got a case of the rights? Aim at the left rough or left edge of the fairway and let your shot shape bring the ball back. Lastly, try replacing your normal practice swing with several baseball-style swings. 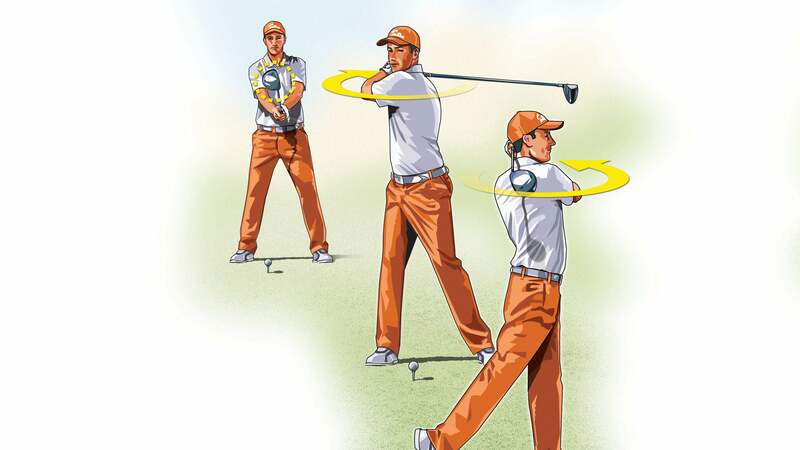 Start with the clubhead in midair at waist height, then swing it back and through like a baseball bat. This will give you the sensation of swinging smoothly without getting stuck on the way down. Make two or three baseball swings, take your setup, and then repeat the same smooth motion on your regular swing. Your drives will soon be back-back-back-back! to normal, slugger. Under pressure, a lot of Tour players hit knockdown-type shots, which are easier to hit solidly and to control. It's not a bad tactic when your iron game is erratic. To hit a knockdown, choke down on the grip, set your feet closer together than normal, and play the ball farther back in your stance. These setup adjustments will help you catch the ball flush, before you strike the turf. Also, when taking aim on approach shots, give yourself a wider margin for error, so you can take big numbers out of play. If the pin is tucked right, mere feet from water, aim 20 feet left of the flag. Always avoid trouble when you're having an off day.